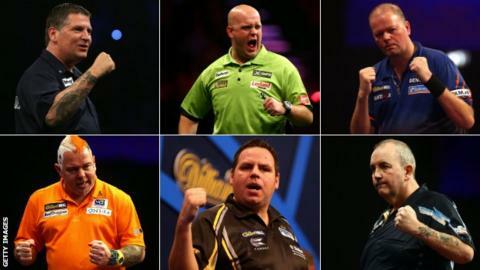 PDC World Darts Championship: Who will win in 2016? The 2016 PDC World Championship gets under way on Thursday. Some argue it is one of the most open tournaments ever, while others see world number one Michael van Gerwen as the overwhelming favourite. The 26-year-old Dutchman has won all four of the major televised events leading into the event and is undoubtedly the player to beat. Gary Anderson overcame Phil Taylor to win his first world title in January and is again among the main contenders at Alexandra Palace. Despite that defeat, 16-time world champion Taylor should not be discounted either - and nor should Adrian Lewis, Robert Thornton and Peter Wright, who have all featured in major finals during 2015. But can anyone stop an in-form Van Gerwen as he bids for a second world title? The World Cup apart, Van Gerwen has appeared in every single televised final at a PDC major tournament since losing to Anderson in the World Championship semi-final 12 months ago. Victories at the Masters, UK Open, World Matchplay, European Championship, Grand Slam, World Series and - most recently - the Players Championship have cemented his place as the world's best at present. "I want to keep putting on great performances," the 2014 world champion told BBC Sport. "I know if I play well, I can beat everyone. "The World Championship is the biggest tournament of the year and you always want to play well. I'm going to perform well." Either Thailand's Thanawat Gaweenuntawong or Rene Eidams of Germany will be Van Gerwen's first-round opponent. "No game is easy," he added. "You always need to play well to win. No player is in the tournament for nothing. I just want to show everyone what I'm capable of." Anderson achieved his lifetime's ambition when he overcame Taylor, the sport's greatest ever player, in a deciding set a year ago to win the world title for the first time. "It's one thing I've wanted to do in all the years I've played," said the 44-year-old Scot, who is based in Burnham-on-Sea. "My name's on the trophy, so if I never win another thing, I'll go to my box a happy man." Anderson quickly followed up that success with a second Premier League title in May, beating Van Gerwen in the final in London after 15 weeks of competition. Has being a world champion changed his life? "I've had less sleep," he joked. "But I'm still the same boring old Gary. I just want to get home after a weekend at the darts." Until Van Gerwen's emergence, many challengers had tried - and failed - to end Taylor's dominance in the PDC. Already twice a world champion at Lakeside before the sport split into two rival bodies in 1993, Taylor has added another 14 world titles in 22 years playing on the PDC circuit and came close to raising his tally to 17 in January, losing narrowly to Anderson in the final. The 55-year-old from Stoke-on-Trent is without a major televised title in 2015, leading some pundits to question - yet again - whether his form is in decline. But write 'The Power' off at your peril. Taylor, himself, said at the European Championship in October that he is playing "better than ever". And Lewis, with whom Taylor won the World Cup with England in June, believes the standard is being raised elsewhere. "Everybody's saying Phil's finished and all that rubbish - what's happened is that everyone's reaching Phil's level," said Lewis, the PDC world champion in 2011 and 2012. "Phil set a bar of 105 and 106 averages, and people are matching that now. He'll probably agree with that. "It isn't that he's come off the boil - yes he's missing the odd double because he's under pressure because people are keeping up with his scores - but when it comes down to it, it's nip and tuck." The PDC World Championship has a habit of throwing up a few shocks. Remember qualifier Kirk Shepherd reaching the final in 2008? Or Michael Smith upsetting Taylor six years later? Wright's appearance in the 2014 final was something of a surprise at the time, although his form since has proved that was not a one-off. Ranked fourth in the PDC's Order of Merit and frequently competing in the latter stages of big events since reaching the World Championship final in 2014, the popular Suffolk-based Scot is yet to win a PDC major. But he is getting closer, as Van Gerwen can testify - he needed a deciding leg to defeat Wright in the final of the World Series in November. Stoke-on-Trent's Lewis, the world number five, is hopeful that regular practice sessions with fellow top-10 player Ian White will boost his chances of winning a third world title. And there are dangerous players throughout the 72-man field - from Grand Prix winner Thornton, to perennial contenders such as James Wade and Raymond van Barneveld, to emerging talent such as Smith and Benito van de Pas. Asked about the depth of talent in the sport, Anderson said: "The class of player now is getting harder and harder. You've just got to go with the flow and if you're good enough on the day, you win. "They've got no fear now. These youngsters want to beat Lewis, Anderson, Taylor - they don't care. That's what's great about it. "It keeps us old boys on their toes. We want to keep our place in darts and just say it's not ready for them to take over just yet."